Minimus snapframes are special snapframes that may or may not have back panels. They are an effective means of displaying advertisements, posters and information on flat surfaces, regardless of whether the event is held indoors or outdoors. They have corner mouldings and high strength serrated strings to hold the posters in place. The minimus snapframes offer you options for screw fixing or adhesive mounting. Each unit is individually packed and shipped with its own set of screws, wall plugs and adhesive pads. 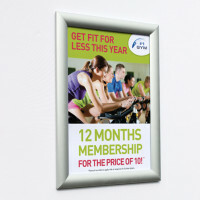 However, customers are advised to use laminated posters if these minimus snapframes ar used outdoors. Take a look at our collection of cost-effective minimus snapframes to fulfill your indoor and outdoor display needs.